I propose a site-specific installation of four oil paintings made in response to the house. A painting will be located in each of the studios. The paintings will be braced vertically between the double cantilever beams crossing the house and the concrete floor, thus integrating the paintings into the house as a removable architectural element. 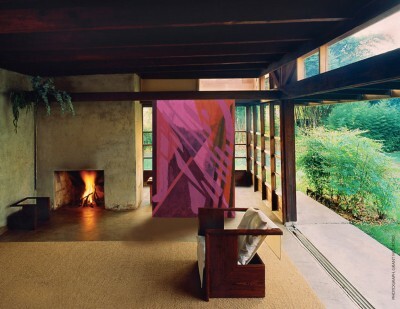 The content of the paintings will play off of the geometric abstraction of the house and its construction. The house becomes instrumental in shaping the paintings. The paintings will be constructed from keyed and expandable aluminum stretchers so that the corners of the paintings do not necessarily have to be square. Considering the aging process of the concrete floors of the house, the painting corners will be adjusted to accommodate areas where the floor is no longer parallel with the beams. 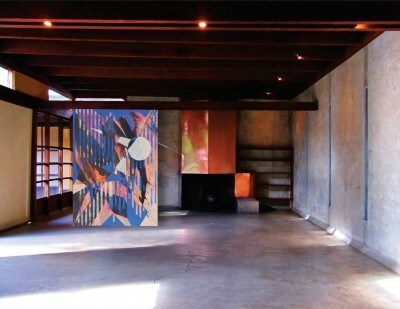 When the paintings are subsequently exhibited at another site, they will retain the shape of the house today and reflect the house’s settling since its 1922 construction. The paintings will double as temporary partitions that are custom-made for each studio. Upon further research for this proposal, I was surprised to discover in Schindler’s writings that one of the original intentions for the beams was to support temporary partitions. In 2007, I began making a series of oil paintings that had the dimension of 75 by 53 inches and a ratio of 7 to 5. The height was based on a “human scale,” and more specifically, my personal scale as I am 75 inches tall. By 2011, the paintings all incorporated a composition that began with drawing an “X” from corner to corner, referring to the geometry and structure of the support of the canvas. I applied the same method to the plan for the Schindler House, treating the plan as a geometric “support” for the architecture. By drawing an “X”through the square floor plan I realized that the northeast-southwest axis crosses exactly one beam in each studio. This is how I arrived at the proposed location of the paintings in the house. Starting from the northeast corner and moving towards the southwest corner, the paintings “rotate” 360° counter clockwise across the house, turning against the clockwise rotation of the pinwheel plan. In the C.B.C. Studio the painting faces east, in the M.D.C. Studio the painting faces north, in the S.P.G. Studio the painting faces South, and in the R.M.S. Studio the painting faces east. When I experienced Schindler Lab: Round One, I became intrigued by the idea of staging an exhibition at the Schindler House that dealt with Schindler’s thought process and the experimental architecture of the house. From the first time that I visited the Schindler House in 2003, I’ve had an interesting spatial relationship to the house because of my height, which is coincidentally the exact height of the underside of the beams. I revisited the house many times over the years and the beams remained focal in my consciousness. Because I was already navigating a similar dimension in my paintings as a scale relationship to my body’s height, I was drawn to consider the paintings as highlighters of the house’s features. The copper fireplaces in the S.P.G. and M.D.C. Studios mark the center of the axis on which the house spins. Having recently exhibited three of my drawings above the fireplace in Schindler’s Buck House through Country Club gallery, this architectural detail of the fireplace stood out for me. I was led to consider the rotation of the paintings as they are positioned throughout the exhibition as a counterpoint to Schindler’s pinwheel plan. Brett Cody Rogers is a Los Angeles-based artist.